Looking for a very easy cookie recipe? 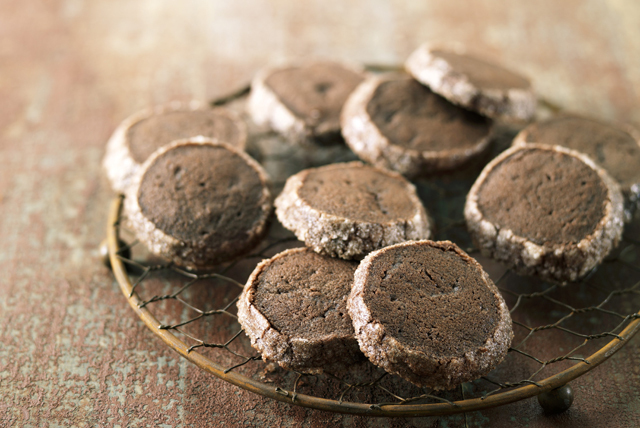 Try our Refrigerator Chocolate Mint Cookies. With lots of chocolate flavour and a touch of mint, they're a yummy treat! Combine flour, baking powder and salt. Beat butter and granulated sugar in large bowl with mixer until light and fluffy. Add egg, chocolate and mint extract; mix well. Gradually add flour mixture, mixing well after each addition. Divide dough into 4 equal portions; roll each into 6-inch long. Roll in icing sugar until evenly coated. Wrap individually in waxed paper. Refrigerate 2 hours or until firm. Heat oven to 350ºF. Cut dough into 1/4-inch thick slices. Place, 2 inches apart, on parchment-covered baking sheets. Bake 10 to 12 min. or just until tops are firm to the touch. Cool 1 min. on baking sheets. Remove to wire racks; cool completely. For best results, do not substitute margarine for the butter in cookie recipes since this will cause the dough to spread excessively on the baking sheet as the cookies bake. Storing the cooled cookies in airtight plastic storage containers or resealable plastic bags will help keep them fresh longer. Metal tins are also good if the lids seal tightly. Let cookies cool completely before storing. Store crisp and soft cookies in separate containers or the crisp cookies will also become soft. For crisper cookies, substitute turbinado sugar, or coarse sugar, for the icing sugar. For a change of pace, substitute almond extract for the mint extract.